How Many Times Will You See Your Parents Before They Die? Hey, guess what? Everything you love is gonna die someday, including your parents. Now, thanks to a new app, you can guesstimate exactly how many more times you'll be able to look into the eyes of your most immediate ancestors before they are committed to dust. Cool. Great job, internet. Designed by your mom, in cooperation with the Jewish/Catholic Alliance of Mothers With Children Who Don't Call Enough (JCAMWCWDCE — they'd work on the acronym but what's the point if their kids don't even care?! ), the not-so-subtly named See Your Folks is supposed to convince selfish jerkhole adults like you and me that we should make more of an effort to get home more often because YOUR PARENTS ARE GONNA DIE SOMEDAY. You simply go to the website, type in your parents' ages and how often you visit, and KAPOW! Mortality. Try it. If you like your family, it will ruin your day. My entire immediate family — mom, dad, brother, sister-in-law, and sister — all live within an hour and a half of Minneapolis. I get home maybe twice a year; less recently due to the fact that I've been moving and switching jobs and getting lost on the way to places. 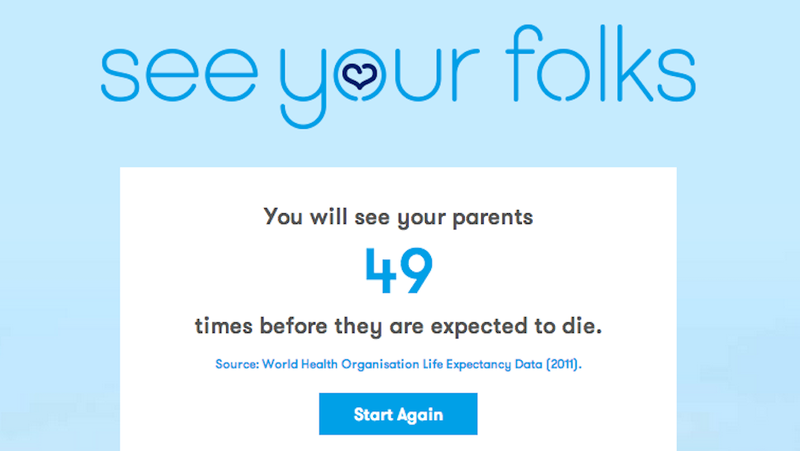 So imagine my shocked quick intake of breath when this website calculated that I'd see my mom and dad — both in their mid-fifties — only 49 times before they die. Slate calls the site "brilliant;" I call depressing as hell. And while the intentions of the site — go see your parents! — isn't bad, if I seriously visited my parents only because I was fully aware of the fact that one day they will be dead, the visits wouldn't be fun for anyone. I can't imagine my parents would enjoy it if I spent the entire time in my childhood home sobbing drug store eye makeup onto their shirts and begging them to write me handwritten letters about lessons they've learned in life.